Today would have been my Mom’s 66th birthday. We lost her to cancer 12 years ago. You would think after 12 birthdays, 12 of my parent’s wedding anniversaries, 12 Mother’s Days, etc., it would get a lot easier, but it really hasn’t. There are so many things that come flooding into my mind on these types of days: memories of being told she had cancer, seeing her suffer, seeing the helplessness in my Dad’s eyes, pleading with God to heal her or take her home to be with Him so she would no longer be suffering, feeling so alone and sad while home alone at night after she died, etc. 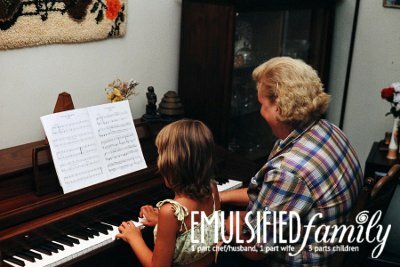 There are of course happy memories as well: family vacations, playing the piano and singing together, doing puzzles, playing with play-dough in the kitchen while she cooked dinner, etc. My Mom was an amazing godly women. She was soft spoken and kind, gentle and loving. She was a wonderful mother to me and wife to my father. While she was soft spoken, she was never shy about her faith. 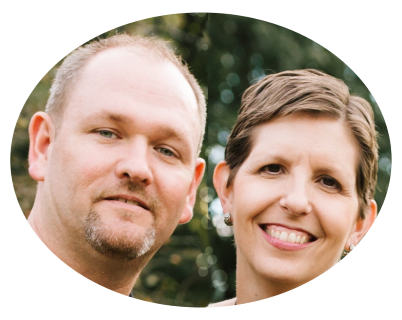 Even sitting in Dr. appointments and cancer treatments, she was at peace and knew that this was what God had planned for her life, even if she couldn’t understand why. She made sure others around her knew that. So even though I miss her VERY MUCH, I know I will see her in heaven again one day because of the relationship she had with her Lord and Savior Jesus Christ. Tthe time right after her death and the Memorial Service wasn’t easy. However, there were lots of family and friends around for support. There were times full of joy and laughter as we talked about her life. My cheeks hurt from smiling so much after her Memorial Service. I smiled more than I cried. The hardest time for me in the grieving process was just a few months after she died. My husband and I were working opposite schedules (big surprise since I’m married to a chef) so I was home in the evening by myself. This of course gave me way too much time to think. I would catch myself walking over to the phone to call her and tell her about my day. Then of course I would realize I couldn’t call her and start crying. My next response was to call my chef/husband. Unfortunately he was working the line in the kitchen and couldn’t just hop off every 10 minutes when I was upset. So that left me alone in our home, very sad and depressed. During this difficult time there were 2 things that brought me great comfort that I will never forget. The first is the sense of peace from God I experienced one evening. The second thing I will never forget is my dear friend, who lived right next door. 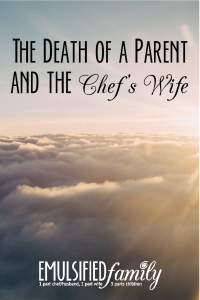 There were nights I just hated to be alone while my chef/husband was working late. I would walk next door, she would take one look at me and invite me in. Many times I would just sit there as they went about their business for the night. I just needed to not be alone and they understood that. I will be forever grateful for her family’s support during this time. Now 12 years have passed. There are so many things I have wanted to tell her or ask her throughout the past 12 years . . . I’m pregnant, my husband just got a promotion, how can I get our 2 year old to stay in her bed, how many miscarriages did you have, what happens to me when I take penicillin, I’m so lonely when my husband is at work . . . the list could go on and on. But through all these thoughts and emotions, I know God is sovereign and has a plan. While I would not have chosen for Him to take my Mom at such a young age, I have never doubted that He is in control. Some days I think about her more than others. She often comes up during conversations with my daughters. Many times it’s because of a memory I had growing up that I want to share with them. My girls start to see the tears in my eyes and remind me that I will see her again in Heaven. This happens EVERY TIME. They are adorable. And because of her death, each time we talk about her I get to share the gospel with my girls. I can share with them how we are all sinners in need of Savior. I get to share with them about how God sent His one and only Son to take the punishment for our sins and how if we choose to accept Him as our Savior, we will be with Him for eternity in Heaven, just like my Mom. I get to have that conversation with them every time we talk about my Mom, because she died. Every time! If she were still alive, we would not be having those conversations. I would be finding other times to have them, of course, but not in such a close, intimate way. My Mom would have loved this! So today as I remember my Mom on her birthday, as I talk to my Dad on the phone, and while I sit with the girls and look at a scrapbook full of pictures of her, we’ll talk and hug and cry. I look forward to the time to once again share with them what the Lord has done for us on the cross. 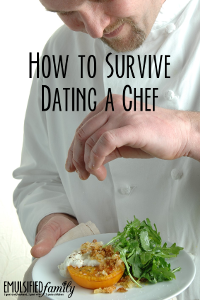 I will probably cry at some point and will call my chef/husband while he’s working in the kitchen, or at least send a text. It will be an emotional day, but it’s a day God has given us and we’ll celebrate her life as we remember her. For those of you who still have your mother with you, hug her today, for me. This post is happily shared over at Christian Mommy Blogger. Because our families were so close, I have tons of memories of your mom, but the one I think of most often is when she came over to take care of us after my mom woke up with a neck so sore she couldn’t move. I think when she got to our house, John was sitting on the table, having just dumped an entire bag of sugar. She was a true friend, and I have learned so much from her example. I was very moved by this post. It brought me great comfort. I just published a post on my blog about losing my mother five months ago. It doesn’t hurt any less because we are grown ups but it does get easier as time goes on. Blessings to you and your family. 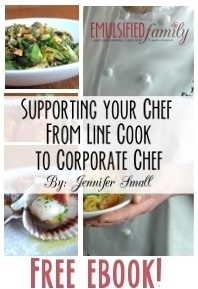 Thank you for the support Jennifer. Best Wishes to you. Dearest Jennifer ~ so heartfelt…..so tenderly touching…such a beautiful memorial of her.